Valiant is proud to support the Comic Book Legal Defense Fund (CBLDF) with the HARBINGER #25 SDCC Liberty Variant, a limited edition release of July’s 48-page anniversary spectacular that features a brand new cover by Harvey Award-winning cartoonist and industry icon Gilbert Hernandez (Love and Rockets, Marble Season, Sloth)! Debuting this July exclusively at Comic-Con International in San Diego, California, the HARBINGER #25 SDCC Liberty Variant will be limited to 750 copies and feature Hernandez’s first-ever rendition of the Harbinger Renegades, Valiant’s best-selling teenage superteam. 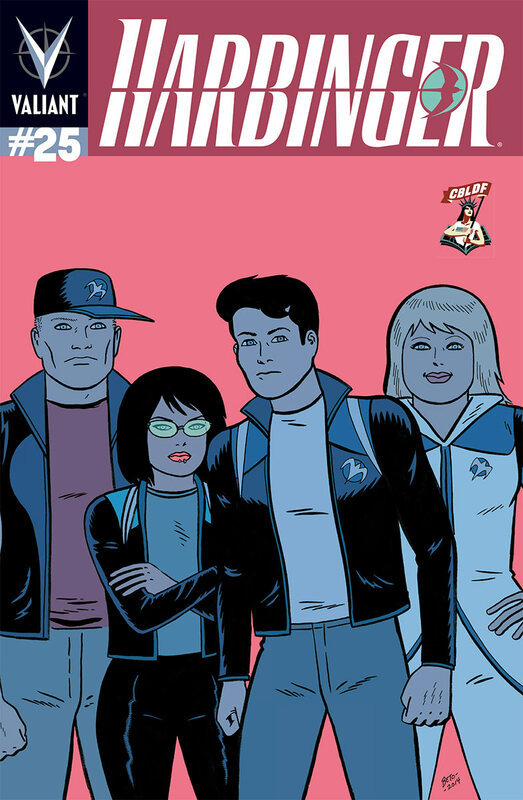 In addition to a new cover by Hernandez on behalf of CBDLF, the 48-page HARBINGER #25 milestone issue also features contributions from a star-studded roster of comics talents, including a lead story by the founding creative team of Joshua Dysart (Harbinger Wars) and Khari Evans (Archer & Armstrong), and new stories and artwork from Vivek J. Tiwary (The Fifth Beatle), Lewis LaRosa (Punisher MAX), Dan Goldman (Red Light Properties), Clayton Henry (Archer & Armstrong), Justin Jordan (The Strange Talent of Luther Strode), Rafer Roberts (Carpool Buddies of Doom), Lucy Knisley (Relish: My Life in the Kitchen), and Barry Kitson (Empire). To celebrate this milestone collaboration, CBLDF will host a group signing at Comic-Con International on Saturday, July 26, during which Hernandez will sign copies of the HARBINGER #25 SDCC Liberty Variant alongside New York Times best-selling writer Joshua Dysart, New York Times best-selling writer and Eisner nominee Vivek J. Tiwary, and acclaimed cartoonist Lucy Knisley. The signing will begin at 12:00 P.M. PT sharp at CBLDF booth #1920 inside the San Diego Convention Center. Hernandez’s HARBINGER #25 SDCC Liberty Variant will be available exclusively at the CBLDF’s booth (#1920) inside the San Diego Convention Center and via the CBLDF website (cbldf.org). All proceeds will directly benefit the First Amendment legal and education work of the Comic Book Legal Defense Fund, an organization that works to protect the freedom to read. Valiant Entertainment has been a supporter of CBLDF since 2012, and a Corporate Member of the Fund since 2013. This marks the second variant cover Valiant has created as a Comic-Con International exclusive for the fund. Valiant is a leading character-based entertainment company with a library of over 1,750 characters, including X-O Manowar, Bloodshot, Shadowman, Eternal Warrior, and many more. Established in 1989, Valiant has sold over 80 million comic books, and today its characters continue to be forged in publishing, licensing, film, video games, and beyond. Since its summer 2012 relaunch, Valiant has returned to the fore as one of the most highly regarded publishers in comics, winning a 2012 Diamond Gem Award for Comic Book Publisher of the Year.